We’ll be aiming to play the French national anthem as many times as possible tomorrow; not because it’s Bastille Day, not because the French are in the World Cup final, just because we like it a lot! It does seem there’s a bit of a French theme heading into tomorrow’s rematch with the Pirates and we’ll be doing our bit to make sure la marseillaise rings out at the end of the day. The Jellis Craig game is shaping up as action-packed, on field and off. The Reds Foundation lunch with Barrie Cassidy and Ged Kearney is a sell-out, there will be an afternoon tea in the community rooms at half time, and of course the BBQ will be back in full swing. Not to mention an AusKick game at half time of the Reserves game and a Fitzroy Junior Football Club Under 10s game at half time in the Senior game. Oh, que c'est amusant! It was early last year when we last welcomed the Peninsula Pirates to Brunswick Street and it will be good to renew acquaintances with our former Premier B rivals. The last time the teams met was in the hail-affected second round and it was hard to gauge form in a very tight contest. 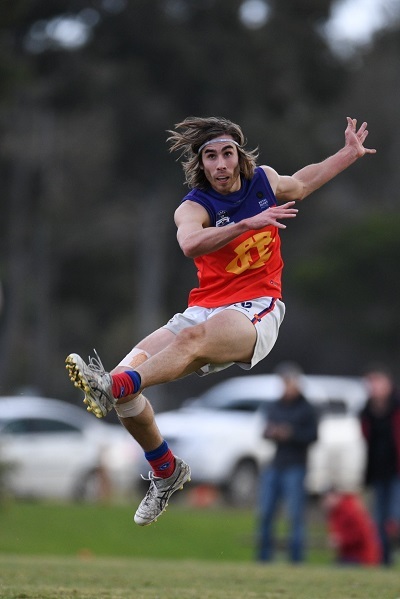 Despite their ladder position, the Pirates always present a challenge for Fitzroy, so it will be interesting to see how things play out on Saturday. Come along, bring your beanie and your cash for the BBQ, afternoon tea and post-match and enjoy Bastille Day, while we do our best to ensure the anthem we share with the French is at full volume. 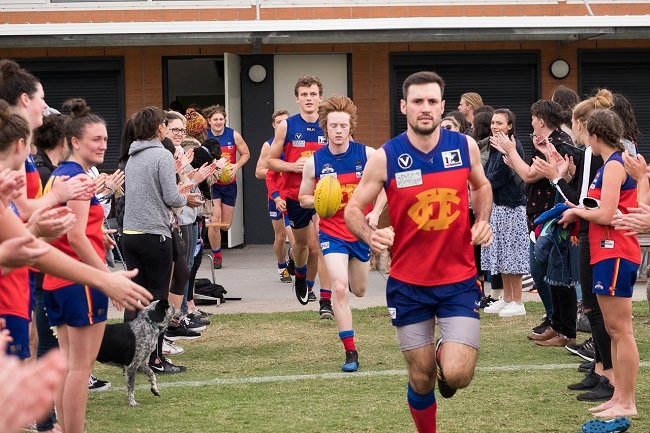 Check out some of the fabulous pics the VAFA shared during the week of Fitzroy’s last win over Marcellin before the bye. Also have a read of their write up of the last round of Premier C games. It happens just once a year so let’s make it a good one. If you are making cakes or savouries for tomorrow’s afternoon tea, please bring them down to the Brunswick Street Oval community rooms before 2pm tomorrow. 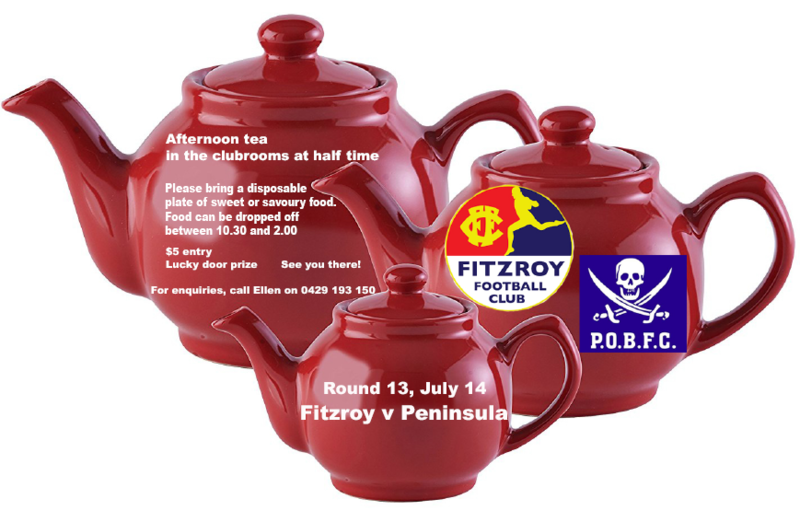 Ellen Makridis is organising Fitzroy’s annual afternoon tea for half time during the Seniors’ game against the Pirates and she's looking for the support of Fitzroy's legion of bakers. All the details are above in your invitation. If you can bake a cake or make some other contribution please bring a disposable, recyclable plate of sweet or savoury food (with details of all ingredients marked) and drop it off to the kitchen/bar in the community rooms between 10.30 and 2pm. If you have any questions or can help in some way, please call Ellen on 0429 193 150. If eating is more your game, bring your $5 cash to the community rooms at half time tomorrow. One is always front and centre, the first with a joke or to lighten the mood at training, while the other tends to go about her business quietly and diligently, but together they have formed an excellent on-field combination in the backline and hit the 50-game milestone together on Sunday. 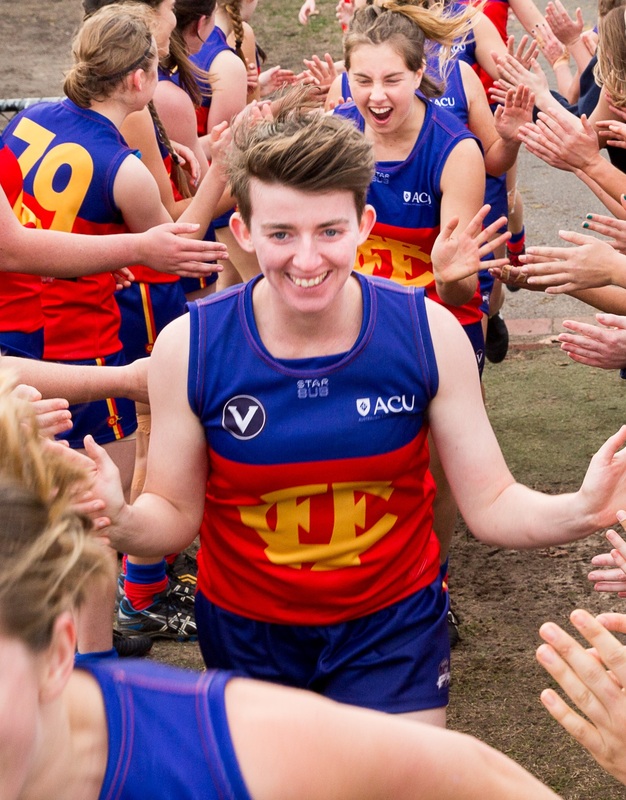 Senior Roy Girls Luci Murphy and Claudia Bell have been at Fitzroy since day one of women’s footy with the Fitzroy-ACU Senior side, and would love nothing better than to keep the team's slim finals chances alive with an upset win over Melbourne Uni in their milestone game on Sunday. 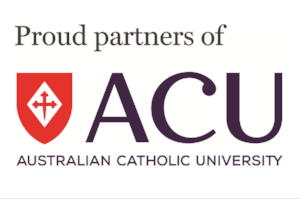 Everything would need to go right for Fitzroy-ACU, but while there’s maths there’s hope! Regardless, there will be plenty of celebrations when these two run out for their 50th games and in the lead up, their teammates had plenty of praise. Perhaps freed by the knowledge their own milestones had already passed, Captain Gemma Minuz and teammate Liz Olney gave us few snippets about Claudia (pictured right running out onto BSO). “The team rates her incredibly highly as a player and as a person, she is strong, humble and hardworking on and off the field,” Gemma says. No doubt these qualities are what caught the eye of VAFA selectors last year when Claudia was selected in the first Big V women’s squad. Liz Olney says her competitiveness is such that she’ll fight to take responsibility for all the kick ins. Claudia’s teammates say she repeatedly saves goals which look all but certain; she defies expectations (and her opponents) and these legendary efforts were on display for those in the crowd at BSO last round. A landscaper by day, Claudia’s willingness to turn up to training after a tough day outdoors and just get on with it has inspired others around her. Her secret is bananas. She attributes her amazing on field abilities to her pre-game banana, which she cannot go without. Lauren Atkinson also attributes every great game she's played to Claudia, who regularly supplies her pre-game banana as well. But as the saying goes, it’s the quiet ones you have to watch. Claudia’s dance moves may need some work after her efforts doing the worm at the Reds Ball last year resulted in a split lip which required stitches! A member of the leadership group and always first with the pun, Luci Murphy has been sorely missed in the middle part of the season with a hamstring injury. She was pretty thrilled to be back on deck at BSO last round and made a big difference. Alice says Luci is a strong leader in the backline and very reliable in defence. An ACU graduate in exercise health science (majoring in outdoor education), Luci spends her days in the outdoors helping kids at Merricks Lodge school camp and working at Collingwood Children’s Farm. She will be back at ACU soon to finish her Master of Teaching (in outdoor ed and physical education). 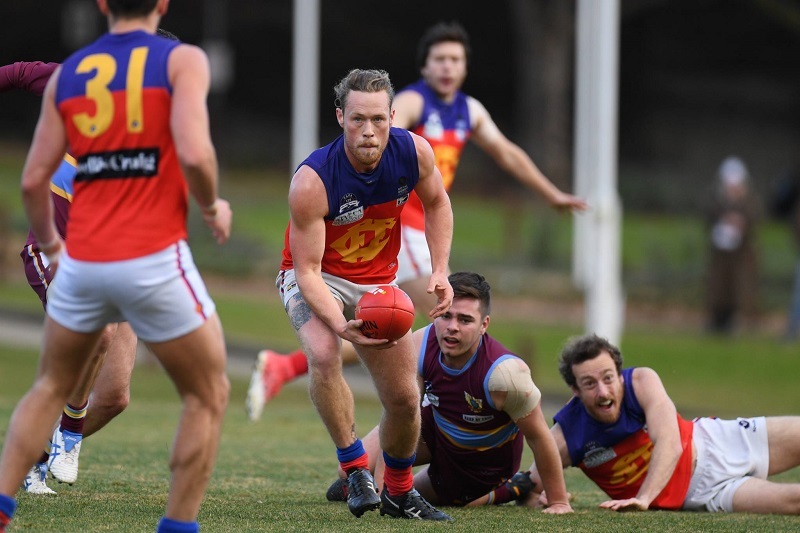 Both Fitzroy-ACU teams are in action on Sunday this week, so it’s an ideal time to take a look at their form. It will be a big day at Melbourne Uni, with a triple header. 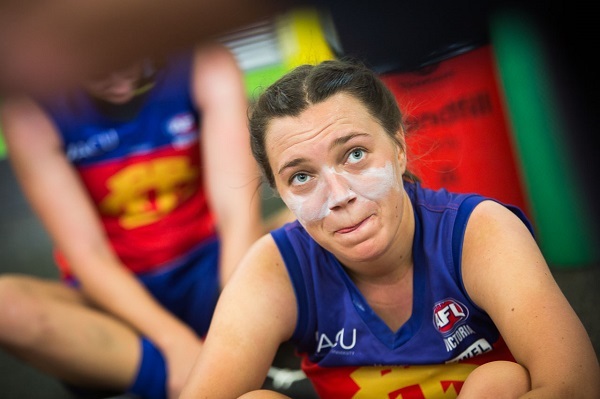 The Mugars games against Fitzroy-ACU Reserves (at 10am) – a likely finals preview – and Fitzroy-ACU Seniors (at 12pm) are the curtain raisers to the VFLW game between Melbourne Uni and Hawthorn. Get along for a terrific day of women’s football. What started as a celebration for a major milestone last year, the Thirds Fan Day is growing to become an annual event. With Ramsden Street Oval all to themselves, this is going to be a big game on the way to the finals and they’re keen to have as much support as they can when they take on Williamstown in the battle for fourth place on Saturday 28 July at 11.40am. Expect to see banners, footy cards, a kicking competition, a meat raffle and prizes. More details coming soon. 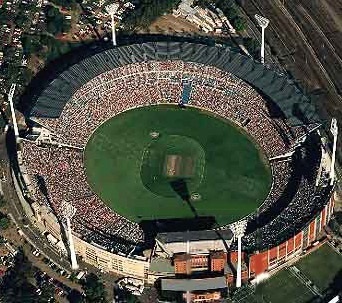 Tomorrow the Thirds play the early game at Glenhuntly Oval; up against Caufield Grammarians at 9.20am. 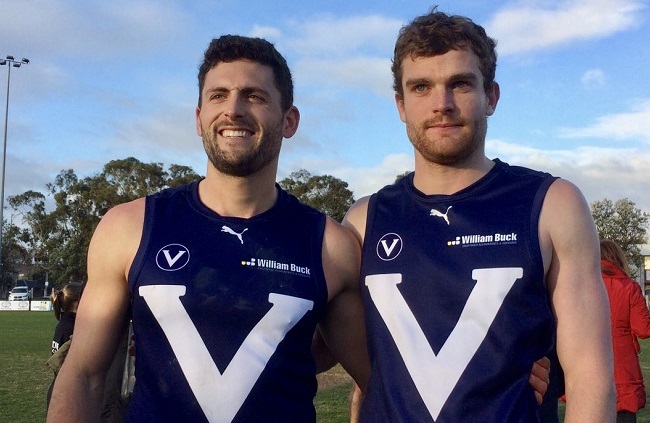 Big V winners - Tom O’Donnell and Max Ellis were part of the VAFA’s winning Big V rep side (Prem B to Div 4), which defeated the WA Amateur Football Association team by 16 points at Trevor Barker Oval last weekend. As always, they represented the ‘Roys with distinction. Fitzroy Rotary is again playing a strong role in developing the leadership potential of our young players, with four Under 19 players recently presented with their scholarship at the annual awards night at the Fitzroy Victoria Bowling and Sports Club. 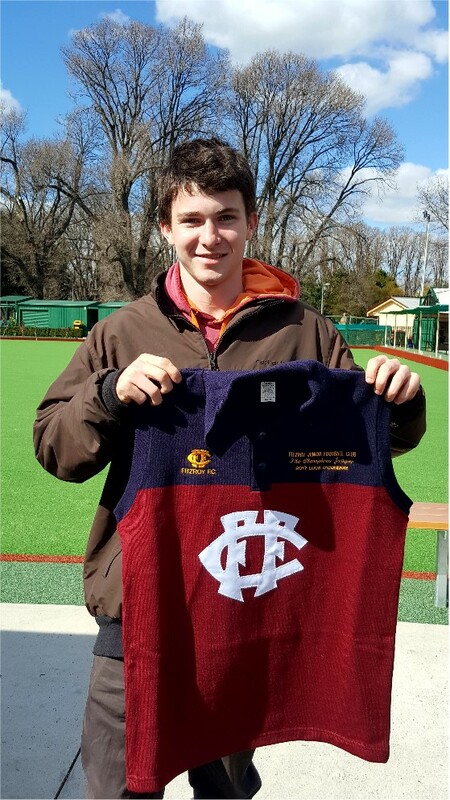 The Rotary largesse spreads right across many of the local Yarra sporting clubs and the lucky recipients for Fitzroy were Ethan Carswell, Jack Walter, Alex Prokos and Donald Bryce. The recipients are chosen as those carrying the values behind rotary itself – dedication, initiative, leadership, selflessness – and in return for the sponsorship, the recipients will each undertake some form of community service with Rotary in the future. Under 19s coach Greg Coleman nominated Fitzroy’s four scholarship recipients and here is a little of why they were chosen, with one tipped to be a future coach himself. Ethan Carswell is the youngest in the Fitzroy Under 19 squad, having stepped up from Colts last year to help out with numbers. He is always the first to training and has rarely missed a training session since the start of preseason. Ethan only started playing footy in the Under 14s and hailing from a Queensland rugby playing background, has a reputation for frenzied tackling. Noted for his third and fourth efforts, Ethan took out the most courageous award in his second year of footy. Alex Prokos was another who was late to take up footy, but his coach says you’d swear he’d been playing all his life. Alex is a line breaking runner with a raking left kick but most feared without ball in hand, as a run-down tackle specialist. He is a strong runner and builds his game around that, and is in his school’s all-time top 10 beep testers. Alex has been praised for his commitment, making the long trek from Mernda to each training session so that he can play with his Northcote High mates at Fitzroy. Jack Walter crossed from Kensington to Fitzroy three years ago and also makes a strong effort to get across town for every training session. The Under 19s centre half back just keeps improving and clearly sets himself some pretty lofty goals. He trekked the Kokoda track last year and is a winner of the Pierre De Coubertin medal for his school, for sporting achievement and endeavours consistent with those of the Olympic movement. Donald Bryce was a long time Fitzroy junior, starting AusKick when he was six. He’s been playing footy for two thirds of his life and has won a couple of team best and fairests along the way! Like Ethan, Donald answered the call for help with Fitzroy Under 19 numbers last year as a Colt. He is often out-sized, but never out-smarted. Greg Coleman says he sees the game so well he’s a definite future coach. 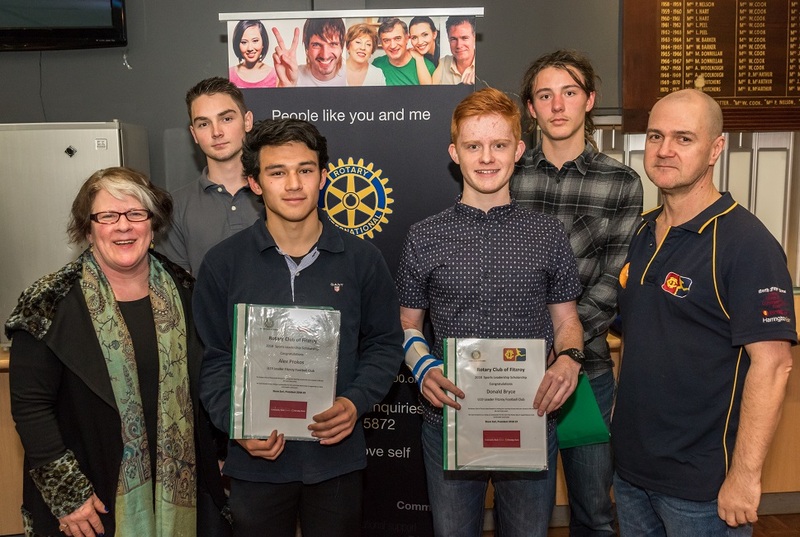 Congratulations boys and a huge thank you to Fitzroy Rotary for their ongoing support and for the wider role they play in the local community. Pictured above is Fitzroy President, Joan Eddy, Ethan Carswell and Jack Walter (back row) and Alex Prokos, Donald Bryce and Greg Coleman in front. You can see the boys in action tomorrow when the Under 19s play Collegians at Ramsden Street at 2pm. It’s must-win game. 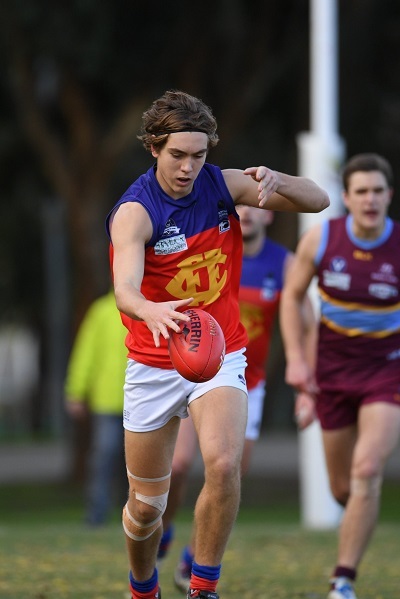 Each year Fitzroy Football Club presents two champions jumpers to outstanding young players from the Fitzroy Junior Football Club who are passionate about playing footy and wish to go on playing at senior level. The 2017 recipients were Phoebe Turnbull and Liam O’Connor and they are certainly making their mark in their first year with the senior club. Not only that, but they wouldn’t hesitate in recommending other FJFC players follow their lead. The RedRoy Mail asked them about their experiences in the first year with the club and got some great insights into these top-class teammates. 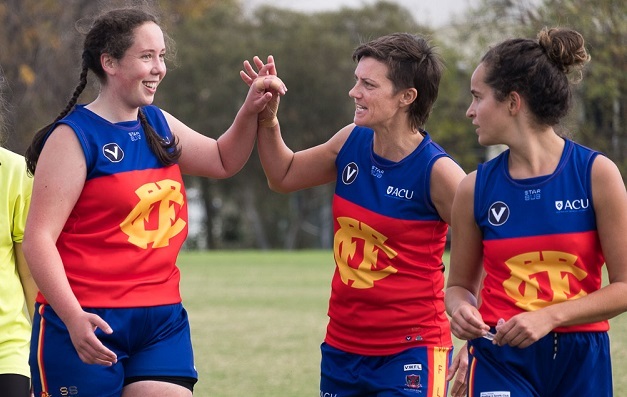 Phoebe (pictured left in a high five with vice-captain Mish Booth) is part of the Fitzroy-ACU Reserves team which is headed for finals for the first time in its short three-year history. It’s an exciting time to be a Roy Girl with the Ressies. “I only started playing last year, at 17, for the Youth Girls after a friend dragged me along to play a practice game with them. I registered later that night and loved every part of my first season. “However, I’ve been around the Fitzroy Football Club since I was about 8 years old watching my older brother play. “I was really nervous about the transition from juniors to seniors, just with having to get to know a whole new team of girls, and getting used to a harder competition. But from the first pre-season training I went to everyone has been beyond friendly and helped all of us new players fit right in. “Everyone just gets around each other, which made it all so easy to feel welcomed. The skills I’ve picked up this year and my move into the back line has also made the transition more than comfortable. The most rewarding part about this year so far is definitely the feeling of each win we’ve all achieved and getting to know this group of great girls and coaches. The hardest part is unfortunately getting stuck with the nickname ‘Malcolm’ thanks to my last name, Turnbull. “I’m definitely one of the youngest on the team, but luckily I joined with Ella D’Cruz and Victoria Raptis, who I played with last year, as well as Emily Drew who played juniors just before me. Being one the youngest comes with some benefits though, I think the other girls take it pretty easy on us with the fine tin. “For the rest of the season I’m going to keep working on my defence and ball skills, and just focus on getting to finals. I think we have a good shot at making it to the grand final if we keep playing with the same intensity we have been lately. 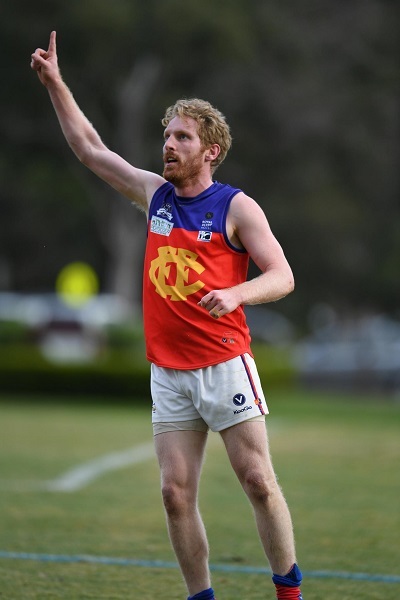 “I would 100 per cent encourage the other FJFC player to graduate to the senior club so they can all experience the community and fun times I’ve got to this year. It’s such a great team to be a part of so hopefully I’ll be seeing some familiar faces next year,” Phoebe said. Reserves Captain Rachael Telfer has nothing but praise for ‘Malcolm’ saying she’s slotted into the team very well, helped by her great, dry sense of humour. Phoebe graduated from Princes Hill Secondary Collage last year and is taking a gap year before going to RMIT to study Biomedicine. 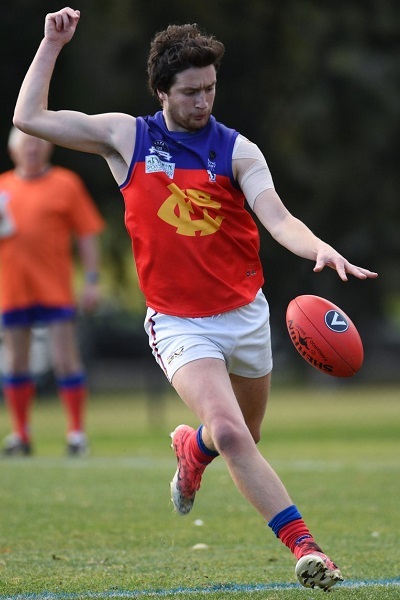 Liam O’Connor, who is currently finishing his VCE at Northcote High, has likewise made a strong transition to Fitzroy’s Under 19 side, which started the season slowly but is now showing great potential. He has already lived every footballer’s dream by kicking the goal after the siren in Round 9 to help Fitzroy defeat Uni Blacks. Liam played with FJFC from the age of 8, when he was in the Under 10s, right through to top age Colts with a premiership in his first Colts’ year. “My transition has been very easy. Knowing a lot of your teammates before actually playing with them definitely helped,” Liam said. “Our commitment was always there from the first game. It’s obvious a new team has to click on the football field and work together and this can take time as we've seen this season. It really comes down to good skills and decision making which is worked on at training. “With the start we had its obviously a tough task to make the four but as long as its mathematically possible, there will be no relent in the hunt for finals! “Winning the champions jumper was a fantastic honour and one I didn't see coming. It meant a huge deal to me especially as it was presented to me by my long term junior coach and friend Robbie McKenzie. “I will always advocate for junior players to come to the senior club. Fitzroy plays great football in quality competitions but it's also full of warm welcoming people who aren’t just about the footy. I know a lot of junior players go elsewhere and the fact that are continuing to play footy is great. Fitzroy just one of the best places to do it at,” Liam said. Coach Greg Coleman says Liam is your classic Jekyll and Hyde. “Easy-going, good-humoured, even a little quiet off field… but an absolute beast on field. He’s vocal, intense, hard-at-it. “He can play inside where he burrows in, wins the hard ball and dishes out to the outside runners. But he’s also fast enough himself to be an outside line-breaker. I had no hesitation in placing him right in the thick it as one of our core on ball brigade. He is just as reliable down back saving goals with run-down tackles or up forward winning games with after-the-siren goals. “I love his tendency to fly the Fitzroy flag if one of his team mates has received a little rough treatment,” Greg said. Sounds like someone we’d all want on our team! Fitzroy’s annual raffle has gone on sale and with the full finals series tickets (donated by the Brisbane Lions AFC: AFL Authorised GF Promotion Code GFAFL 18/17) on offer and a selling price of just $5 a ticket, you’d better get in quickly. The second prize is one of Louise Maniatakis’s magnificent Fitzroy-inspired quilts and if you’re a fan of the Fitzroy of old, the quilt has plenty of interest. The stitching detail alone makes this a valuable prize for any Fitzroy fan. Tickets will be on sale at all home games too. The raffle will be drawn at the post match function at Brunswick Street Oval after the Senior men play their final home and away game on Saturday 25 August.